For many people, looking at Facebook is the first thing they do when they wake up. There are about 600 million users on Facebook, and you might as well say that Facebook – together with other SNS like Twitter – has a monopoly power on the Internet. This is in strike with the old ideology of the web; that of a decentralized, open and free network. Is it possible to create a new platform that is not as capitalistic as Facebook? How can you use Facebook in other ways, for example to make art? What is social about social media? These kinds of questions were asked at the Unlike Us conference in March. Unlike Us is an initiative by the Institute of Network Cultures and Cyprus University of Technology in Limassol. By creating a research network, organizing several conferences and publishing an Unlike Us reader, it tries to have a critical look at Facebook, start discussions and provide alternatives. 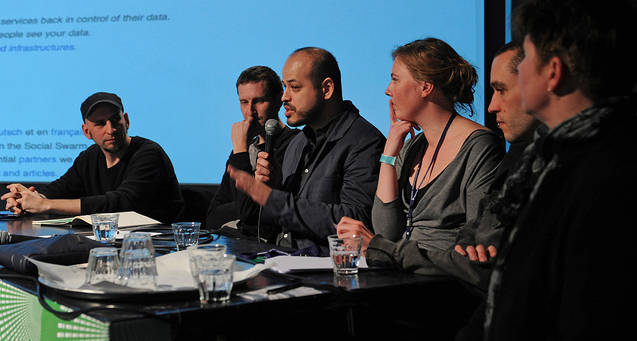 The second conference was held in March this year in Amsterdam, and I was present as part of the Institute of Network Cultures team. What was interesting about the conference was the fact that is was not commercially grounded, but initiated from an academic and critically ground. For example, no time was spent on advertising or the way businesses can use Facebook. As a matter of fact, instead of inviting businessman, hackers were invited to show how to use Facebook in different ways and to introduce other social media platforms. One whole day was spend on showcasing Facebook art and alternative social media like Briar, a project that is building a news and discussion platform to enable people in authoritarian countries to communicate without fear of government surveillance or censorship. But what happens when you put hackers together? On the first day of the conference they decided to occupy the lobby of the hotel they were staying in to have a hackaton and order pizza. After that, I saw occasionally groups of hackers sitting together – away from the academics on stage – making plans for a new hackaton in Germany. The conference was bringing these people together, not only virtually but also physically. The remaining two days were filled with talks of experts, academics and critics about topics like: defining the social, artistic responses to social media, the private and the public, software matters, the pitfalls of building social media alternatives, and social media activism. Unfortunately, I could not hear every speech because I had some production tasks to do, but I am glad I heard some interesting talks like ‘Europe versus Facebook’. Austrian law student Max Schrems immediately caught my interest when he started talking about his project ‘Europe versus Facebook’. After asking Facebook to send him his personal data, Schrems received 1200 pages. This consisted of content about everything he had done so far on the site, even content about pokes of years ago and data he deleted. He did research and found out that Facebook does not comply with European laws. Together with his group he filed 22 complaints against the European Facebook located in Ireland. The process is still going and even though some changes were achieved, for most issues Facebook is still breaking European data protection laws. Three weeks ago they celebrated their one-year anniversary; Facebook is clearly not eager to do something about it. For me the Unlike Us conference was really special. I got the chance to have dinner with many speakers I only knew from my University reading list and listen to the newest knowledge available about Facebook and the alternative social media platforms. I even interviewed Jodi Dean and had a discussion with Dylan Wittkower about my thesis. Dylan Wittkower’s theory about four different types of identity construction (see conference report) had a lot in common with my Bachelor Thesis about identity construction on Facebook. I really appreciate the discussion we had about the topic. At the conference I had to opportunity to see in real life what is going on at this moment in the field of new media, instead of only reading about it in class. The next Unlike Us conference will be held on 22th and 23th of March.